For such an accomplished woman, Jennifer Willey felt like a fraud for a very long time. A former news anchor and tech executive at some of the world’s largest and most prestigious companies, Jennifer knew she needed to do something about the persistent feelings of doubt cutting her down from within, so she made it her life’s work to examine them. In the process, she founded Wet Cement and turned herself into a gender equality expert. This past International Women’s Day, Jennifer gave Bare Necessities an exclusive overview of her Wet Cement program on that silent saboteur, Imposter Syndrome, with solutions that can help you go from feeling like a con artist to living authentically in confidence. Jennifer said she never felt like the smartest one on the team, lived in fear of being fired and thought she had to work harder than anyone else to prove her worth. “After three months’ training in a new field, I certainly didn’t feel like an expert. I also felt like an outsider on so many all-male teams,” said Jennifer. Not even winning a global-level talent award eased her doubts about belonging at the top. She shared research from Access Commercial Finance conducted in 2018 that, of 3,000 women, 2 out of 3 felt like imposters in the last year; in creative roles, the figure shot up to 9 out of 10. Seemingly confident stars like Tina Fey, Jodie Foster, Meryl Streep and Beyonce have all publicly articulated their intense self-doubt. If they feel like phonies, can there be hope for the rest of us? According to Jennifer, Impostor Syndrome is “feeling like a fake, a fraud or that you will be ‘found out’ despite being a high-achiever with proven success. Sufferers are unable to internalize and accept their success but rather attribute it to luck, timing, personality and extremely hard work, as opposed to their own ability, talent and/or skill.” It was first identified more than 40 years ago by psychologists Suzanne Imes, PhD, and Pauline Rose Clance, PhD. Per the American Psychological Association (APA), while the phenomenon isn’t an official diagnosis in the Diagnostic and Statistical Manual of Mental Disorders, psychologists acknowledge that it’s a very real, specific form of intellectual self-doubt. Impostor feelings are generally accompanied by anxiety and, often, depression. At the office, Imposter Syndrome disproportionately affects women, targeting high-achievers who are self-aware enough to care about how others perceive them. “If you were to read a job description, men are likely to apply when they meet 30 percent of the criteria. Women need to feel they meet more than 70 percent,” said Jennifer. That inhibition prevents women from achieving untold potential, and that realization spurred Jennifer to dig into the problem. In partnership with a professor at the Wharton School at the University of Pennsylvania, Jennifer researched the biggest challenges to women’s workplace potential by interviewing 50 male executives. She found five major perception hurdles women have to overcome: a lack of confidence, assertiveness, presence, standing up for themselves and taking ownership. Many women have experienced that feeling of getting to where they are by timing or luck rather than their concerted efforts. At work, it often happens when a woman has been singled out, feels like a token of her gender or gets the sense that she doesn’t fit in. The Perfectionist: For her, it’s all or nothing. She has to be 100 percent prepared before taking a leap—and ends up delaying important projects until she feels they’re perfect. Instead, Jennifer recommends pulling the trigger once you hit 80 percent, then iterating and improving so as not to impede any progress. The Superhero: This type is addicted to external validation. She tends to feel like she’s a phony though everyone else is the real deal. To get the constant stream of validation she needs to feel successful, she’ll work longer and harder than everyone else, burning out herself and those around her. A better way to frame things, per Jennifer, is to be proud of your work but don’t push so hard. Focus on what matters most, and put blinders on to the rest. The Natural Genius: Things come easily to someone so innately bright…until they don’t, which shakes her to the core and leads her to avoiding things that challenge her. Jennifer says the antidote here is knowing it’s not reasonable to expect an A+ on everything you do in the real world—and that’s not going to break you, either. The Rugged Individualist: This person prefers to go it alone and has a hard time asking others for help. The solution is to learn to collaborate with and empower others, which in turn actually elevates your own feelings of self-worth. The Expert: Do you feel like you need every conceivable credential under your belt to be ready to make a bold move? Spoiler alert: You don’t. See #1 and go for it when you’re almost all the way to bright. Of course, it’s tough to cure yourself of an affliction that society at large sets you up for. Recognizing and acknowledging the signs are half of it, according to Jennifer. She recommends going deeper by reading The Secret Thoughts of Successful Women. You can also fake confidence until you feel it. According to APA, this is the best way to bulk up your confidence muscle. “Ask yourself what you can do differently to manage your Imposter Syndrome, or what you can do differently to help someone on your team who may be suffering from it. Often, it’s creating a more collaborative culture in which it’s okay to fail and learn from your mistakes,” says Jennifer. For proof of your abilities, catalog your achievements on a regular basis. Jennifer suggests writing down 10 or more accomplishments you’re most proud of over the course of your life, in the past five years and in the last three months. Look for themes or categories that emerge which point up your greatest strengths (i.e. creative, strategic, team builder, negotiator). Take a photo of your list, save it to your phone and set a reminder to add to the list once a week. 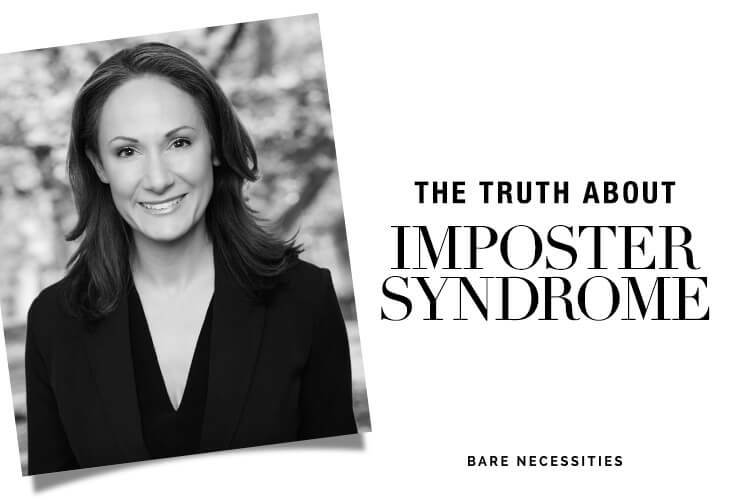 Thank you Bare Necessities for spreading the word about Impostor Syndrome and the toll it can take on the mindsets and careers of those who have been touched by it–the first step is knowing you are not alone! And also a big thanks for supporting the women of both Bare Necessities and Walmart through your commitment to learning and development for International Women’s Day #IWD2019.